A well-timed coincidence is always intriguing, and this week has provided one. Readers of the blog may recall that I’ve mentioned Lee Child before, author of the Jack Reacher books about the adventures of an ex-Military Policeman. Amazon was kind enough to give me a free Kindle copy of what turned out to be the ‘gateway’ book to the series, and I got hooked. Since that ‘free’ edition I’ve managed to purchase several others, and it’s only a matter of time until I’ve read the entire Jack Reacher collection. My current read is “Without Fail”, and the first chapter begins with Reacher being hired to ‘audit’ Secret Service security for a newly elected Vice President. 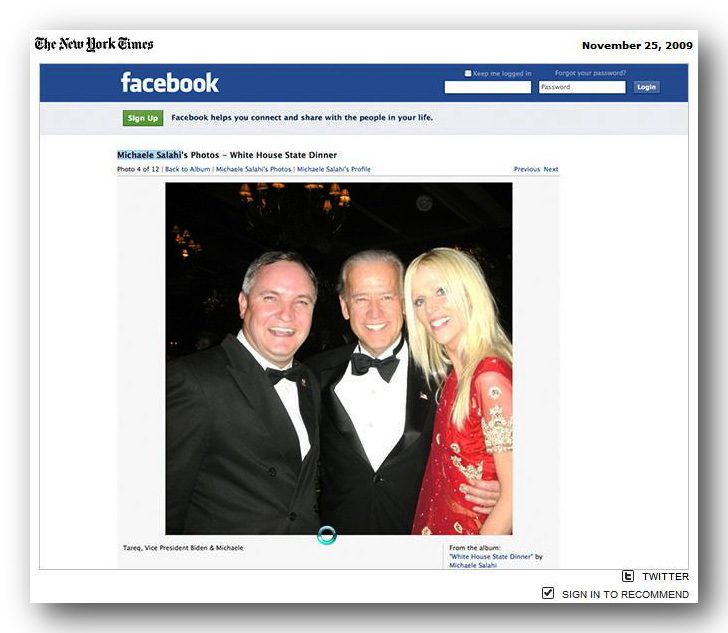 During the ‘audit’ Reacher’s (attractive) female partner penetrates the security net at a public Donor’s Dinner and has her picture taken with the VP, thereby ‘proving’ they were close enough for a successful assassination attempt. So imagine my surprise when I open the NY Times yesterday to see this picture of Joe Biden and his ‘not-quite-invited’ friends. In the book Reacher and partner diverted an actual guest and then took her place at the function; but in real life maybe they wouldn’t have had to go to all that trouble? I continue to highly recommend the Jack Reacher series, and not just because of interesting coincidences. In my opinion it’s better than Bond, and updated to post 9/11. What I particularly like about Child’s style is that he doesn’t use ‘cut-aways’ to a different scene to keep your interest. It’s just one long narrative, each chapter picking up where the previous one left off; the pace never slows. Child’s writing reminds me of the long opening shot in “Touch of Evil” the Orson Wells film of 1958. Leslie and I took a film class and the instructor points out that the first 3 minutes of the film is one continuous shot with no breaks. It was a milestone of sorts in the film industry. If you decide to try out Child, I would suggest starting with “Persuader“. After all, it worked on me. Great link, fascinating. We have a film class this afternoon and I will share this with our Instructor! I was going to tell you about Rope too, but John beat me to it – drats!